For most of us this week involved a long weekend. I used this to take my time a bit more with the shopping and preparing of my weekly meat, as well as getting some training in. Having more time on my hands meant putting this training into a film for you all to see what a good grunt session can look like. The style of training I did is commonly called Advanced German Body Composition training. I will touch on this briefly today. Next week I’ll touch on the next workout and wrap up some info on German Body Composition (GBC) and the advanced version. This type of training incorporates a lot of work with short rest intervals. The idea here is that the longer and harder work paired with short rest periods stimulates an increase in the production of lactate which in turn promotes an increase in growth hormone. This leads to body fat loss, lean muscle gains and muscular endurance. The advanced version of GBC that I did this week (see the attached videos) is not for the faint hearted or people with a young training age (relatively new to resistance training). I’ve been training since I got the Hulkamania Workout Set for Xmas when I was 8 years old, so I’m ok to go. This is a good example of how getting and staying lean, strong and fit doesn’t come easy, it requires application and hard work. For those of you who are new to resistance training a standard GBC would perhaps suit better, and that I’ll get into more next week. This involves heavy weights, hard work and short rest times, and the resulting high level of lactate will have you sucking in the oxygen and wishing the workout was over! If you want to give it a go, contact me for more information and recommendations, but go lighter to start with and ALWAYS make sure your form is perfect! In my workout I did a bend followed by a pull. This means I did 3 exercises involving a bend, 6 of the first, 12 of the second and 25 of the third. I had 2 minutes rest and went again for a total of 4 rounds. I then moved onto a pull and followed the same rep/rest/set protocols, which advanced GBC calls for. Check out the two videos to see an example of a round of each and more details on the exercises themselves. Earlier this week with the Easter long weekend approaching I had decided to catch up with mates on the night I normally try and cook my meat of the week, knowing that I’d have plenty of time later to cook and write. However with Easter Friday meaning a lot of shops are closed, I got prepared and headed down to the butcher on Thursday afternoon to purchase my meat. I was greeted by Tom with an enthusiastic “Mikey!” I waited while he served some other customers and pondered what I’d be having. The word was they had some fresh Guinea Fowl for me. Not much pondering went on in the end as I had literally had a base of nothing to go on. Just as I reached for my pocket and the use of another Google search it was confirmed that Tom indeed had a Guinea Fowl for me to crack into this week. I began asking him about what to do with it, he offered up that he’s never cooked one, but because it’s seasonal and slightly gamey, go for similar options to accompany it. He then spoke to someone behind me and said “you’ll know about this?” I was instantly confused and instantly thought Tom might have a long dormant lazy eye, but turned to see another customer, whom I learned to be Glenda, patiently waiting her turn to purchase. Glenda then rapidly gave a bunch of recommendations for cooking guinea fowl and what to have with it. This conversation promptly evolved to a swift description of my meat mission for 2012 and my blog. Initiated by Tom I might add, not me forcing it on every person I talk to… A series of questions from me followed, like are you a chef, then subsequent chatter about the guinea fowl and Glenda’s recommendations. Some of the terms and dishes thrown out were another language to me and some sounded like hard work, while the main option of forming a pastry around the bird by repeatedly rolling in flour then egg until a thick crust formed just didn’t sit with me. White flour isn’t going to enter this blog if at all possible. Why? Ask in the comments box below if you’re interested. I did like the idea of using seasonal vegetables to match the guinea fowl. So once I’d bought the bird (and used my best poker face talking to Glenda, pretending I picked up everything she mentioned) I wandered the supermarket whilst simultaneously searching on my phone how to make some of these ideas. I was excited and nervous about cooking a new meat and the random fervent conversation that had just taken place involving my blog and meat in general. I took my purchases home and let them chill for the day. The next day I settled on a recipe for the bird and accompaniments from a combination of an online search and Glenda’s suggestions with my own twist on things. I was set to make a Middle Eastern Roast Guinea Fowl with Saffron Quinoa, Beetroot and Sweet Potato Puree with Sautéed Mushrooms and a Small Garden Salad. 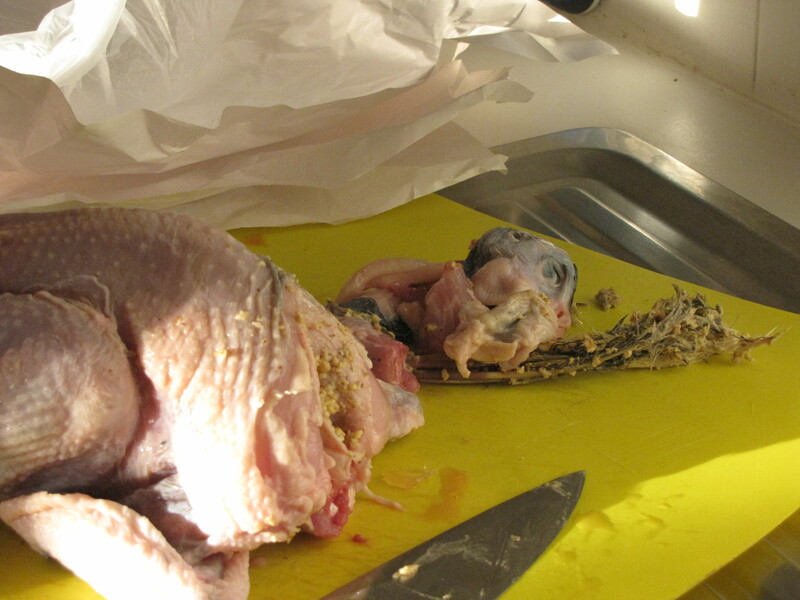 Dealing with the bird was a first as not only had I never done guinea fowl before but I had never come face to face with, ah, the face of an animal I am about to eat. Well apart from fish I suppose. This little guy had its head attached, and it was a strange site, but to the words of “off with his head!” I used the knife in a guillotine like action, crunched through the spine and just like that- off came its head. 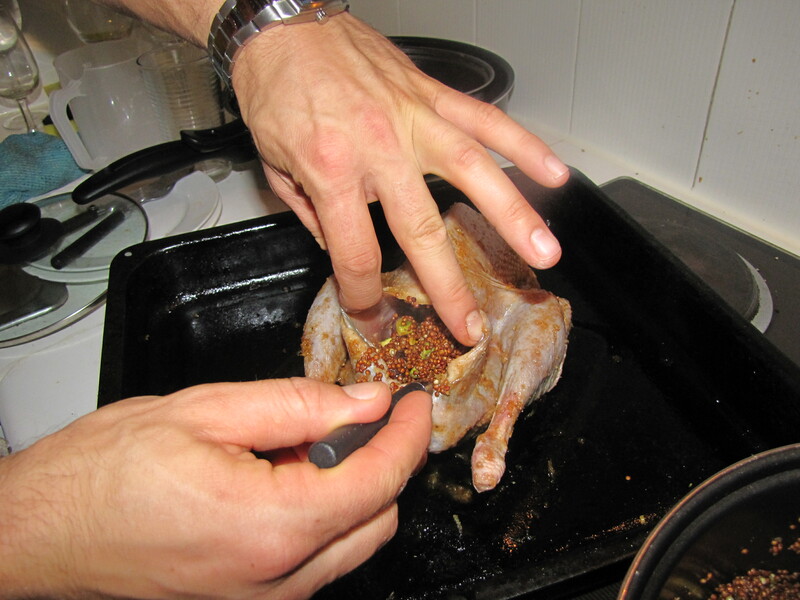 Glenda suggested using it to make a jus, however once I’d had to remove what appeared to be its last meal before it was killed, I decided maybe it’s best to just remove this whole area and get on with cooking the bird, before I vomit. 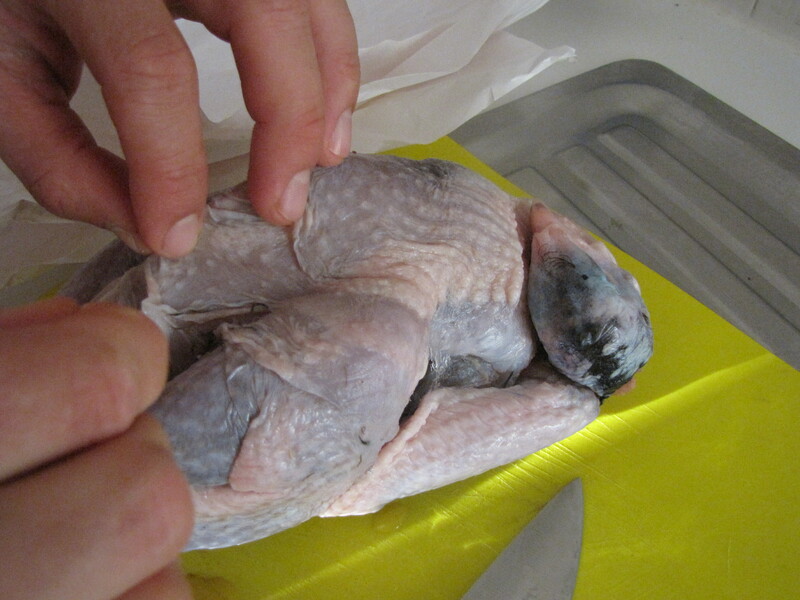 My assistant (not an actual paid job, more for the love I believe) went to making the mix that would baste the bird while I got the bird chopped, washed, dried and ready to be basted. Once this was done, the quinoa was prepared with vegetable stock and a few chopped dates and a handful of smashed pistachios were added with salt and pepper before some of this was used to stuff the bird (those last 3 words usually place together in that order down the pub on a Friday night I believe…) and the rest sat waiting to be added to the roasting dish in the last 20 minutes of the cooking. 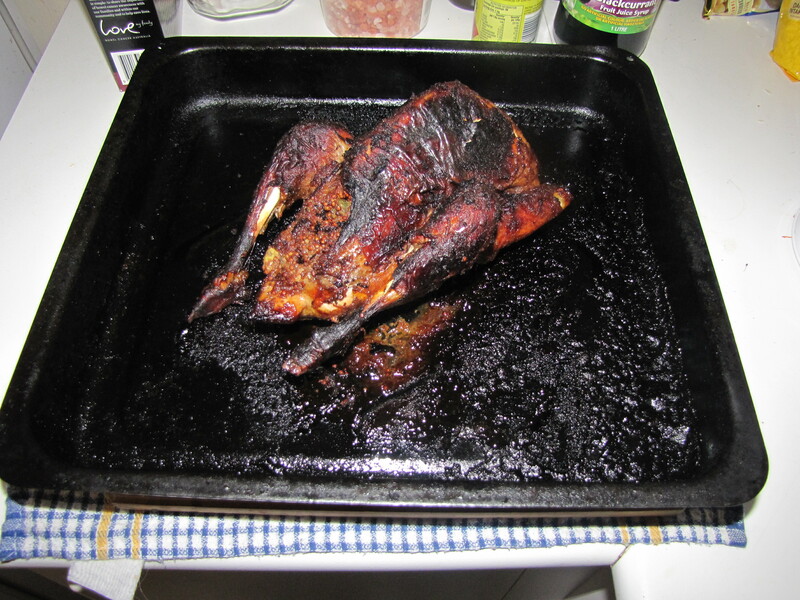 The bird went in the oven and the other things were put into action. The beetroot and kumara were boiled and when ready added to the kitchen wiz with some butter, a dollop of natural organic yoghurt and salt and pepper. As this was happening slight disaster struck. The recipe for the bird called for an hour of cooking then adding the rest of the quinoa and cooking for a further 20 minutes. However at the 45 minute mark I checked the bird and discovered an alarming amount of black colour when there should ideally not be! I removed the bird and hurriedly tried to figure out what had gone wrong. Then it hit me: it’s a 1.5kg bird in the recipe. Not knowing the exact weight I was still sure mine was less than 1kg. School boy error from me! Still, it was only 45 minutes and there was at least juice still running out when I put a knife into the flesh. I covered it in foil and we went about trying not to panic that I’d f*cked this up completely. Once all the extras were ready, I carved the bird and we sat to eat. The plate looked busy and was chocker with food. Luckily I was starving and ready to crack into my first guinea fowl! The flavours of the baste were beautiful on the meat. 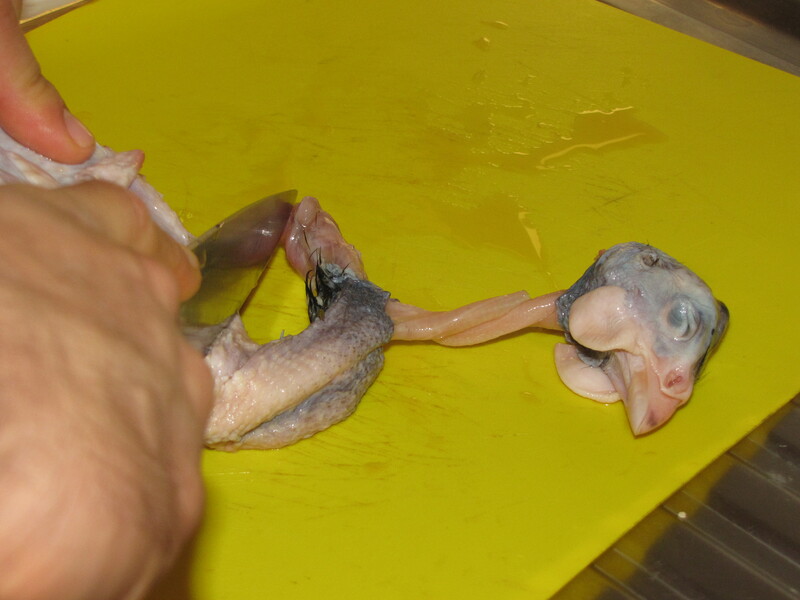 However much like an over made-up, high maintenance bird of the human variety, the meat itself was a touch overdone. This was a massive disappointment, especially as it was just a stupid oversight on my part. Still, I liked it, but judging on that, knew it could be so much better. 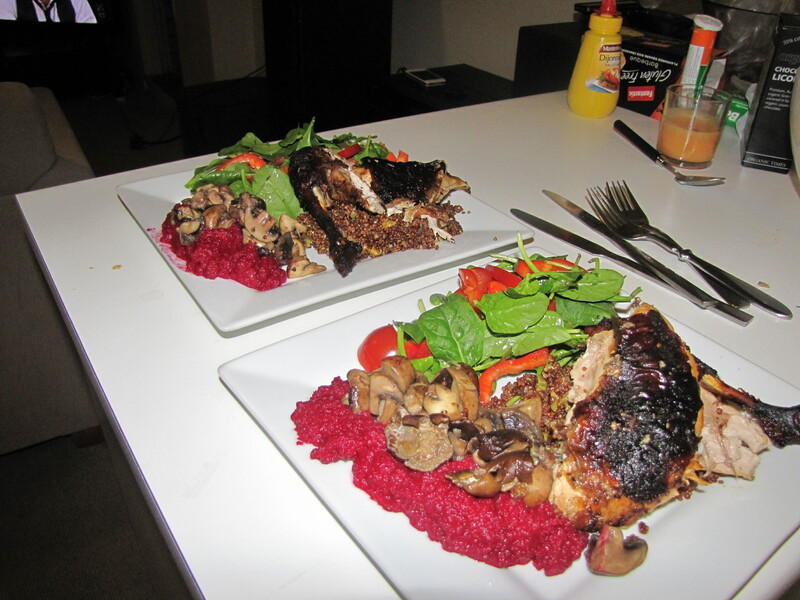 The beetroot puree topped with the mushrooms was divine and the slightly sweet quinoa was easily the champion of the whole dish. In fact there was enough of this left over that it made for a delicious breakfast the following day with some yoghurt, walnuts, a chopped feijoa and some cinnamon. So overall I was happy with the meal, but the meat is what this is about right, so on that front- I liked it but a bit on the dry side which was my fault alone and added immense frustration to this as a first time meat. Just like my brother in law getting inappropriately drunk, at my sisters 21st birthday in front of the family, (enough to have to leave) I know that this first impression will last. Hopefully I can redeem if given the chance to cook guinea fowl again. I say that (somewhat safely) as these birds don’t seem incredibly common or easy to come by. They are seasonal and having read up on them, it sounds like they make for an amazingly helpful farm animal, some claims even stating that they keep out and will kill snakes! That’s a pretty nasty bird. I certainly didn’t see any evidence of that with my bird, just some grass and other half digested vegetation-like stuff, definitely no snake! This is nevertheless, another week done! 14 weeks of different meats over with. I already look forward to next week. I have no idea what that will be, but I’ll get thinking and see what I come up with. As always, please keep the feedback coming as well as suggestions for meats or recipes, and requests for subjects to be covered. Next week I’ll also continue on with this short exercise series and there’ll be the next workout to go with it. Please continue to help me grow this community. For a small business like mine social media is the best way to grow, and even though I do this for the love of it, it obviously links into my training business. So if you haven’t done so, please get to my Facebook page and ‘Like’. And share this post with your friends, family and colleagues. Every little bit helps me build and keeps me going with this week in and week out. I want to improve and make each post better than the previous, and your help, yes you, makes that so much easier!